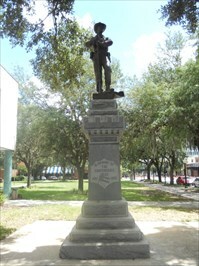 Very sad that suddenly here in central Florida a Confederate Statue just has to be moved. It’s a selfish and intolerant move by people who obviously are filled with rage and hatred. You see in the video the screaming rage on the faces of the people who want to remove this statue. And only Nazi and ISIS type individuals tear down history. Notice: The South lost the war. Maybe we can revise that, too, make the South the winners? Seems nobody is ever satisfied. There’s nothing like a sore winner. Let us have our little flags and monuments (many are huge really) and we, unlike the agitators, will be happy. 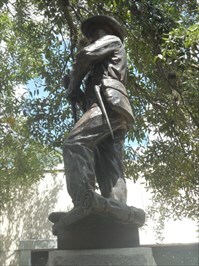 Ever wonder why there are so many statues and monuments in the South? Because the South was invaded and not by a band of angels. 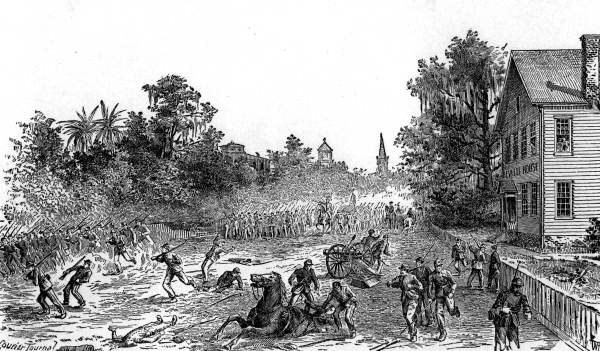 There were hundreds if not thousands of battles all over the South. So would anyone expect that the men would not fight back to try to protect their wives and children and protect their land? This is Central Florida and yet Union soldiers were way down here fighting. People died, lots of them so they deserve to be memorialized. No, they probably were not perfect men, I’m sure they were not, but they lived in the society in which they were born. Countries are made up of people. And people are not perfect. I think the authors of all this unrest should maybe look into their own hearts to reflect on how they could channel their energy into something that is positive not destructive. I don’t even believe this. FBI director: We ‘disrupted’ many July Fourth terror plots. Well, as I said from the beginning, Obama in a nutshell: Can I just finish my waffle? Remember when Jonathan Gruber said Obamacare was passed basically because of the stupidity of the American people and admitted that they would rather have the law than be transparent as promised. He was basically bragging about it and his part in it. Than, when the president was asked about this comment Gruber made, he lied bald faced. I mean bald faced. His comment is below. It’s kind of a it depends on what the meaning of is is. He was “some adviser” and not officially on “staff” per se. Turns out he was extremely involved and he was called the “hero” when Obamacare passed. On Morning Joe, MSNBC, the question was asked of the panelists by Joe Scarborough: “Did the president lie?” Each one of them (except for Mika who said it appeared that he did) said “Well, he was less than forthcoming” after which they broke out in belly laughs and giggles. Very funny how the administration lied and deceived the American people about Obamacare. I guess it’s just me, but I don’t see anything funny about the president lying to the people, not once or twice but many times and then even when caught red handed, he continues to lie and say the same thing. Now, that is a degree of liar that is beyond what I would call normal. But this, also, is a part of the bias in the media. They minimize it, laugh at it, so people won’t take it seriously. ED HENRY, FOX NEWS: At your Burma townhall a couple of days ago, you tried to inspire young leaders by saying, “governments need to be held accountable, need to be responsive to the people.” I wonder how you square that with your former adviser, Jonathan Gruber claiming you were not transparent about the health law because in his words the American people, the voters are stupid. Did you mislead Americans about the taxes, about keeping your plan in order to get the bill passed? PRESIDENT OBAMA: No, I did not. I just heard about this. I get well-briefed before I come out here. The fact that some adviser who never worked on our staff expressed an opinion that I completely disagree with in terms of the voters, is no reflection on the actual process that was run. We had a year-long debate, Ed. I mean, go back and look at your stories. The one thing we can’t is that we did not have a lengthy debate about health care in the United States of America. Or that it was not adequately covered. I would just advise — every press outlet here, go back and pull up every clip, every story, and I think it will — it’s fair to say there was not a provision in the health care law that was not extensively debated and was fully transparent. Now, there were folks who disagreed with some of the various positions. It was a tough debate. President Obama’s dismissal of MIT’s Jonathan Gruber as just “some adviser” he barely remembers, rather than a key architect of ObamaCare, has always been one of the flimsiest and most transparent lies told by this profoundly dishonest White House. Of course, I am fully aware that to the Obama supporter who is still defending him it wouldn’t matter if he had been the killer in Charleston. They are defending his use of “ni**er” and I’m sure it would be the same for murder. I won’t use the word because I don’t use it and also because if anyone thinks it will now be okay for whites to say it, it is a trick. Don’t try it because you will be brutalized and destroyed as others have been, no matter if the president says it and Don Lemon on CNN holds up a big sign with the word on it. There is a man named Rodney Haley formerly of Baltimore, Maryland, now serving 12 years in some federal prison somewhere for a number of crimes related to selling millions of dollars in renewable fuel credits from a total sham shell business he operated. This is just a little drop of the fraud that has and is going on under the so called Clean Air Act or Green Energy. This was aired tonight on CNBC’s American Greed program, which is a shocking marathon of ways in which crooks have managed to make millions conning others out of their money. It was just a little thing, but is a perfect example of the way the corrupt media, in this case NBC, misrepresents and brainwashes the unsuspecting and gullible public. In telling Mr. Haley’s story, they slip in a clip from 2005 of George W. Bush announcing something about renewable energy and then proceed to detail how this guy easily collected millions of dollars selling something that didn’t exist, the biofuel credit. And it all took place during the Obama Administration and under the Obama EPA in the cesspool that is Baltimore, long after Bush had returned to Texas..
Not once was Obama’s name mentioned as presiding over this massive fraud because he must be protected at all times. No, they had already set it up as being something to be blamed on George W. Bush. You would think Obama himself wrote the script because he is so expert in blaming Bush or the pentegon or Iraq or anything and anyone for what is his own fault. It was all approved by the Obama administration’s epa who had no intention of stopping him in any way. Truth be told, Daley would still be carrying on with his fake business if it had not been for his neighbors who turned him in for parking numerous luxury vehicles all up and down the street in front of his house, creating a nuisance and hazard to those who lived around him. He should have bought him a warehouse somewhere to put his cars in, but I guess in addition to being so dishonest, he was also uncaring and disrespectful of his neighbors, thus his downfall. My point is, listen closely to all so-called news programs or documentaries because they are filled with these little subtle tricks so easy to fall for. Never heard this message before delivered on inauguration day 2013. I don’t think the nation responded to the message but instead has descended to unheard of and unimaginable new depths. Love the pre-PC era when everyone wasn’t wrapped so tight.